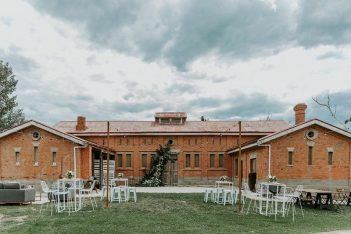 Mewburn Park, 2.5hrs east of Melbourne, is a 400 acre private property and working farm offering a beautiful colonial Homestead dating from the 1850’s, as is the heritage listed brick stables. The Homestead is wrapped with a huge verandah, taking you back to the glorious 1920’s, while the Servant’s Quarters take you back even further to the colonial 1850’s. Mewburn Park offers a range of locations, helping couples create a wedding that is unique for them & their guests. The established gardens at the front of the Homestead offer a botanical garden vibe for ceremonies. Guests will arrive through the meandering garden paths, bringing them to the couples exclusive area of huge old oak trees, palms, fish pond and open lawns. 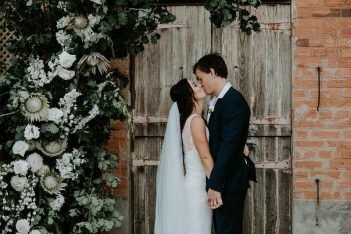 Mewburn Park’s heritage listed Stables offer a beautiful spot for intimate ceremonies in the courtyard. Draped in festoon lights, this festive space helps create a unique experience for all guests. The Stables pop up bar also allows guests to enjoy this private and secluded area before the evening begins at the reception. Slowly make your way into Mewburn Park’s clear view marquee; where guests can take in the ‘farmcharm’ that surrounds and the stars from above. The 21 x 1o metre marquee offers plenty of space for a sit down evening or a relaxed cocktail party with tables, chairs and festoon lights all included. Within the 1850’s Servant’s Quarters of Mewburn Park Homestead, the boutique Bridal Suite is tucked away. Offering a quiet space for brides and co. to relax and prepare for the day ahead. Contact the crew at Mewburn Park on how to create your wedding at Mewburn Park. Julia and Adam Vardy independently run Mewburn Park Homestead. The Homestead has been in Adam’s family for over 30 years, and they have now returned from Europe to offer a unique and fun experience for couples and their guests. The Homestead is still running a dairy farm, giving it an authentic and relaxed farm atmosphere. Mewburn Park was one of the first Homesteads in the region, dating back to the early 1840’s, and is in the heart of Gippsland’s food and wine region. 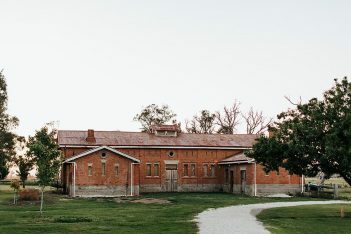 In the early years, the Homestead was always connected with the community of Maffra, with its pine tree lined golf course, tennis court, Sunday school sessions and Church services. 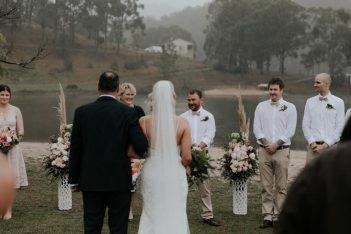 Now Mewburn Park Homestead is again connecting to the local community through festivities and events, and broadening it’s exposure to the rest of Victoria. A beautiful mix of rustic farm charm with a modern twist. To help create your wedding, please contact Julia and Adam on ways to make this happen. Coffee House 138 - Delicious breaky and lunch, and of course coffee! Tinamba Hotel - Award winning restaurant. Boutique vibes, delicious! Maffra Sports Club - Yum bistro meals, try and get upstairs on the deck for drink! We are the dreamers, innovators and self-confessed tea addicts. The Planners, Advisors and Designers who continue to push the creative boundaries when it comes to Weddings and Events. Light and Type are two greatest loves. Light is what we chase, covet and capture for romantic and tonal wedding photography. Type is what we craft, hone and embellish for beautiful stationary and invitation design.